You are here: Home / Resources / Every Single Profitable Note Marketing Idea In the World (Almost)! Stuck for some creative ways to market for notes? 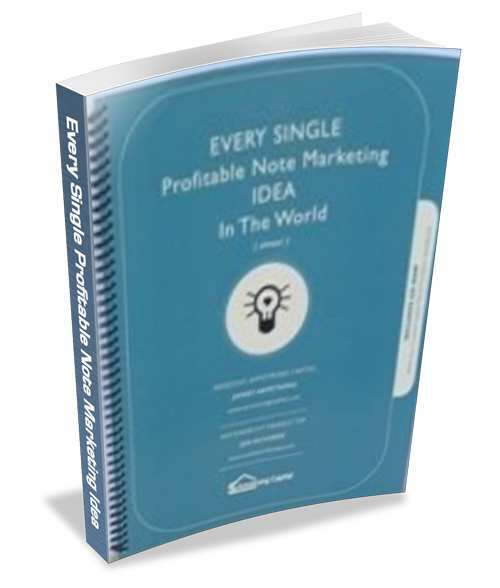 First off…Every Single Profitable Note Marketing Idea in the World (Almost)! In this influential book, written by Jeff Armstrong and Jon Richards, you will learn the inside secrets that successful note brokers have been using for years to build a profitable note business. Discover dozens of practical tools that you can start using right away to turbo charge your note buying business. Included is the complete “Note Holder’s Handbook”, brochures, direct mail letters, flyers, and much more. Feel free to copy and adapt the many ideas in this book to get notes flowing to you like steel to a magnet! There are thousands of mortgage notes waiting to be purchased, but most of them are junk. They just aren’t investment quality. Finding the good ones is like panning for gold. You have to wash a ton of gravel to find a nugget. What does this mean for you as a note buyer or broker? It means that you must have a marketing plan in place that will generate a steady flow of mortgages for your consideration. A proven and effective marketing plan! All of the important ways to spread the news about your note buying service. How to contact note holders. How to develop a pool of professional referral sources who will send you notes, and you can pay them a referral fee from you commissions. To build your business through centers of influence. To use the media in a low cost way. How the professionals develop a profitable direct mail campaign. To develop niche note markets no one else is taking advantage of. Plenty of marketing materials you can copy and improve on. How to use the “Note Holder’s Handbook” in your marketing. You’ll see examples of letters, postcards, brochures, flyers, ads and other promotional material that would cost you hundreds of dollars to create. The purchase of this e-book comes with the right to use any and all of these tools to promote your note business. The “Note Holder’s Handbook” is also included in text file format for easy adaptation. Every Single Profitable Note Marketing Idea in the World (Almost)! is filled with priceless techniques, tips, plans and examples to generate a flood of cash flows to your office. We’ve kept the price so low that you just can’t afford not to have it. Order right now so you can put these powerful tools to work for you as soon as possible. But that is not all we have in this package! 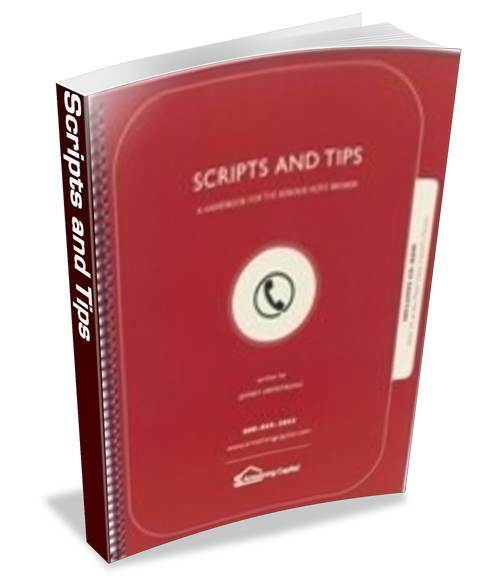 You will also get…Scripts and Tips! Learn to negotiate and earn fees like a seasoned professional! In this handbook Jeff Armstrong shares with you how he runs his one-person note business including finding notes, gathering information and negotiating. Never struggle over what to say to a note holder again! Jeff has also included valuable scripts, tips and forms that will put you on the fast track to success as a Real Estate Note Broker! Working by himself as a Note Broker since 1991, Jeff has consistently placed in the top 25 producing brokers for the #1 funding sources in the nation.